Print full sized play money, game money, blank checks, unit money for allowance or chores, and place value money at this page. Ready-made play money may be purchased and it is sometimes stocked along with party items in stores. It is easily found online at websites such as Amazon (Nasco Complete Bills Set, 500 Bills, Grades K - 4), but if you would rather print play money, then you may print play money from donnayoung.org for your personal use. 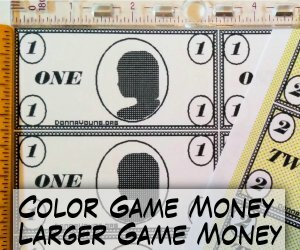 Color Paper or Not: If you want the bills to be easy to sort, then I suggest you print each bill denomination on a differently colored paper. Alternatively, there are only 6 different bills and each one is clearly marked, so printing each denomination on differently colored paper is not completely necessary. If you have access to the color bills, then you have other choices to consider. Print on Both Sides of the Paper: Yes, if you do not want the back of the bills to be blank, then print the same file on both sides of the paper. Of course this means the president's head will be on both sides. Note- The bills are centered on the paper, so the bills should line up when printing on both sides, however; if the printer skews the paper when printing the other side, a tiny imperfection in alignment will occur. The first group of files are gray scale. Each printed file yields 4 bills. There are two choices of each bill in the color files. Like allowance, but worse! Fill in dollar value and sign. Teach your children how the old people paid for things. This play money is very simple. I designed it mainly for use as a place value teaching aid, however; the bills can also be used as board game money. The bills are approximately 1 1/4" by 2 1/2". Larger bills are available. There are 24 bills on each printed sheet of paper. I strongly recommend printing each value on differently colored paper for easier sorting. That can be a problem because a pack of differently colored paper usually contains 6 different colors, some might have 8, and there are 15 different denominations in the complete set. Colored files are available.